Nearly 200 years after their last recorded sighting, land iguanas have been reintroduced to Santiago Island in the Galápagos archipelago. The famously funky lizards went extinct on Santiago due to the introduction of predators such as the feral pig, which were removed from the island in 2001. Over 1,400 land iguanas from nearby North Seymour Island were released onto Santiago, marking the first time the reptiles have been known to be present on the island since British naturalist Charles Darwin recorded them in 1835. 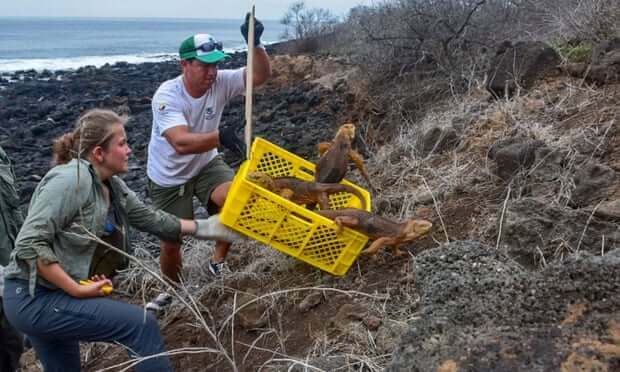 The National Galápagos park authority is running the ecological restoration program responsible for the release, which also aims to protect the roughly 5,000 iguanas still living on North Seymour, where food is limited. The reintroduction is an important step for improving the fragile ecosystem of the Galápagos archipelago. “The land iguana is a herbivore that helps ecosystems by dispersing seeds and maintaining open spaces devoid of vegetation,” said Danny Rueda, the park authority’s ecosystems director. It's survival of the funkiest, and the iguanas are here to stay.